My mum always did what you would expect a mum to do: she came to parents' evenings at school, she took us on holidays or out to the park, she threw us birthday parties and made us cakes. She even put glitter on her fingertips and glue on the letterbox to make it look like Father Christmas came in that way the one year I asked him to. In short, she ticked every box. Except perhaps her insane habit of following bumble bees until they landed on flowers and began stroking their fuzzy bodies. Never once was she stung, I remember that as a fact. I had a great childhood really, and she was always there when it mattered most. But I would be lying if I said she was always happy. In fact, as far as I can remember, she was in a bad mood half of the time. But that was because she knew what was coming. My mum when I was 7 1/2 months - clearly the most attractive baby you've ever seen. 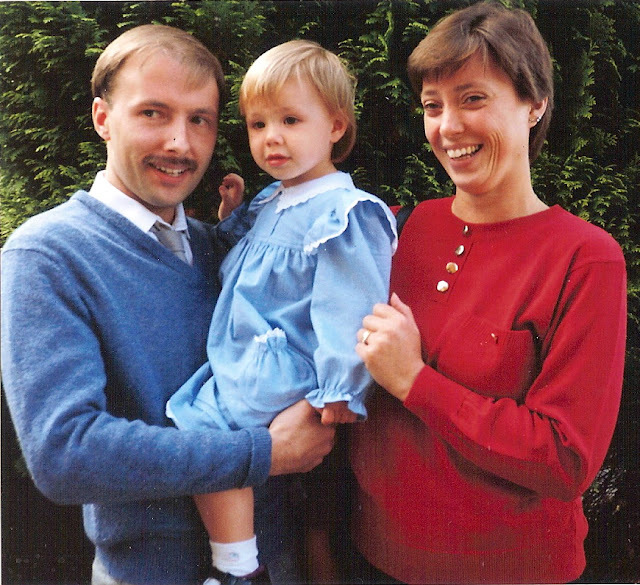 In 1989, just a year after she married my dad, she was diagnosed with multiple sclerosis. I don't know what caused her to go to the doctors or how long it took for her to get that diagnosis, and I also don't know what went through her mind when she was given it - I wasn't born until 1991, and I can't really ask her about it - but I know that it changed her. It couldn't not have. But while I knew she had multiple sclerosis since I was little, I never understood what it was. In truth I thought it was nothing really because she seemed just fine. She didn't look or act ill or anything, so I shrugged it off. Nothing seemed to be wrong. She still seemed to be fine when she started going to a help group when I was about 10, I think - at least, that's when I remember her going - and she used to get counselled there. I didn't know why, but I remember on days we were off from school and had to go with her that the car journey took forever. And the place had rubbish toys. You know how it is, when you're in a boring place and you're 10 years old, you will play with the coloured blocks on wires meant for 5 year olds. But what surprises me now I look back is how unaffected I was by this place. I don't know if I understood the situation even less than I thought, but every time we went, there were people there with walking sticks, in wheelchairs, people not entirely 'present' and other people sat in oxygen tanks, and yet none of it frightened me. I remember saying to my dad "we're lucky Mum's MS isn't as bad as these people's," and at the time I was right. I saw these people and thought there were varying degrees, and my mum didn't seem to be suffering like them, she just seemed a bit sad. The people there sat down to talk to me once - they were lovely, even the patients - but I didn't really understand what they were telling me. In fact I can't remember a single thing they said to me. I remember they gave me a little book designed to explain it to children, but I don't know if I ever managed to finish it. It wasn't long, I just wasn't interested. 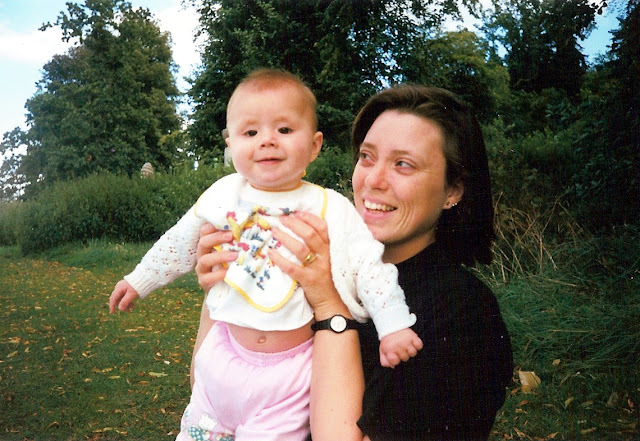 I was convinced my mum was more or less fine. It was when I was 13 that I started noticing things. My mum had a disabled badge which meant she could park in the disabled parking spaces - even now it's an alien notion to park a car on the other side of the car park from where we want to be when I'm with friends or other family - and whenever she got out people would look at her as if looking for her disability, and there was nothing to see. Some people even shouted at her and told her to park further away and leave the spots for people who needed them. It made her cry and I used to shout back at them. But still I saw nothing wrong with her. Until she started to fall over. She would just collapse like her feet stopped working for no reason at all. Some people would laugh thinking she tripped, and others would help her up. It took her a long time to start using a walking stick, and she hated it because...well, because she was a 38 year old woman with a walking stick. After a year or so she started having greater trouble walking and would fall more often and need her stick more often, and eventually she started using a zimmer frame - those 4-legged frames elderly people use to get around with tennis balls on the bottom - to get around the house. I don't recall if she ever used it outdoors, but if a walking stick was that bad, I doubt it ever ventured beyond the garden fence, if even that far. It terrified me when she got a wheelchair. She would use it once in a blue moon and she could still walk around, but it was then that I recalled the lovely old man in a wheelchair in the MS Centre. Suddenly it dawned on me that her MS was getting worse. Yes, it took me that long. My mum's friends gradually started to disappear when I was a teenager. They stopped visiting or talking to her, and soon a few members of the family did the same. I didn't realise at the time, but I'm beginning to think she was purposely alienating them. I don't know if it was because she was jealous of their health and bitter about her own, or if it was because she didn't want them to suffer with her, or she just didn't want them to see her the way she knew she'd end up. I think it was a bit of all of it, and I can't blame her for feeling that way, but in time it left her with only her immediate family: me, my sister and my dad. I moved to Hastings when I was 17 and I remember texting her when I went there for the first time to say I was in a London train station. She texted back saying "don't forget to have tea with the Queen!" Funny how I remember that. I moved back home when I was 19. Suddenly she was always in a wheelchair. She couldn't stand up for long and her hands were shaking a lot. She couldn't hold on to things. Her eyes literally shook and she couldn't really see anything. Somehow, while I was gone, she began to really deteriorate. Or it seemed that way, at least. Perhaps it was because it was all happening comparatively slowly while I still lived at home so I didn't notice it, and in the year and a half I was gone I wasn't seeing the change so it became extremely obvious and drastic when I came back. Remarkably, one of her friends had stuck around even to this point and I'm really grateful to her for doing so. She'd come over, make a cup of coffee for them both and sit and talk to her for a good hour even though she didn't seem able to follow a conversation. Her friend was always cheerful and put on a brave face, but in time even she left. That made me sad because now my mum really did only have us, but given how long she stayed around I think, in the end, she just couldn't watch her friend deteriorate further, and there was nothing she could do to help. I don't think she realised that just coming over and talking to her was the best help she could give, but I don't begrudge her leaving. I think, in truth, she had better reason than most. She didn't give up, she simply took as much as she could. Since then things have been a blur. Over the past 5 years she's steadily gotten worse. She could still think for herself when I was 19, and she could get out of her chair to reach things just out of her reach sat down. She could speak clearly, think clearly. Then she began falling out of her wheelchair, her legs giving out while she tried to stand and she wouldn't have the strength to get back up. She'd suffer surprisingly severe injuries in the falls, too, and they frightened me as well. But we all did what we could for her. Then she stopped speaking quite so much, she would forget things, and one such thing she would forget was that she couldn't stand up. So she would try, and she would fall immediately. She needed constant supervision. I'm not sure how clear her mind was working at that point, but it just continued to get worse. She wouldn't be much for conversation, and when you said something to her - anything - she would respond with "why?" Things were getting very, very difficult to cope with at that point, she was always trying to get out of her chair, she wouldn't ask for help because she wouldn't think to, she was confused and forgot a lot, and her mind was seriously slipping, so when she literally responded with nothing but "why?" for 3 hours straight, things got frustrating. I would get angry. I would shout. I could barely handle it. So when she moved out of the "why?" phase, I was relieved, though that happened gradually, too. But again things only got worse. She would forget who we were. Fortunately she wouldn't try to stand up any more and she wouldn't reach for anything, but she also didn't do anything. She would watch TV but I don't think she was really seeing it. But she would laugh every now and then when someone said something funny, but that would be about it. But that would be all. That's how it is now. She watches the TV or looks out of the window, and she listens to the radio. We found that music has an amazing ability to stimulate her - you hear about the stimulating power of music - and while she will go days saying just 3 words, sometimes, out of the blue, she'll sing along to a few songs on the radio. Out of time and off-key, but it's more than just 'something'. But she can't read books - she can't hold books - she can't do the puzzles she used to love, she can't feed herself or do anything for herself, not even move her wheelchair, and she doesn't even think to ask for something if she needs it. If she needs a drink, she won't say anything, you have to read her mind, and if you ask her a question it can take up to 6 attempts to get even just 'yes' or 'no'. She needs constant supervision and company because if anything were to happen, she would do nothing. She wouldn't even call out for help. She would just laugh. Why laugh? The single positive thing about multiple sclerosis is that it can cause euphoria, and she has the biggest case of it, a drastic turn around to what was actually depression before her mind started to leave her. Now she smiles all the time, she laughs all the time, and if she didn't, I don't think any of us could cope. Her smile lights up the room. Her mind is extremely simple and anything will make her happy. In fact it's kind of hard to make her sad. Her laugh sounds like a cheerful owl hooting, it's adorable, even though I hear it a million times a day when asking her if she wants a drink of water. Fortunately two family members have returned to us since she's gotten so bad, but I wonder if it's because they feel guilty. But, regardless, we're grateful for them coming back, and I think she is, too, even if she can't express it. I admit, however - and this may surprised you - that I don't struggle with this. Anymore, at least. Even after my year and a half away from home, everything happened gradually enough that I didn't really notice it, and because of it we've been able to adapt both ourselves and the house to deal with it. There are a number of hoists and slings to lift her from her wheelchair, there's a bath chair to get her in and out, we've even had a wheelchair lift installed in the dining room. Dad built decking so she can go outside in the garden and ramps have been placed around the house so we can get her around. Of course, I'd be lying if I said that writing this post was easy. And I also admit that I hate Mother's Day. It's envy really. I don't feel as though I don't have a mum, but I do feel that I'm missing the relationship, and all the posts and things you see about the wonderful things people's mums do just makes me sad. But I still make an effort for Mother's Day even if she's unaware of it. I make her a cake, I buy her a gift, some flowers and a card. It's hardest, I'm certain, for my dad. He didn't expect his life to go this way, but he's a strong, brave man for standing by her through it all, and I do all I can to try to decrease his work. There is, as yet, no cure for multiple sclerosis, and I also know that if one were both discovered and distributed tomorrow, it would be far too late for her. For those just being diagnosed, however, it might be enough. But at the moment all we can do is try to manage the symptoms, and that much medication just creates new problems. Smaller problems we can deal with, but new problems all the same. So much work still needs to be done in research and spreading awareness of the disease if we're ever to find a cure. The more people aware of it, the more minds that may come up with a solution. Or, at the very least, less people shouting at seemingly 'fine' people in disabled car parks. The disease can affect anyone and for no good reason at all - as far as we know, it isn't diet-related, activity-related, pollution-related or life-style-related. 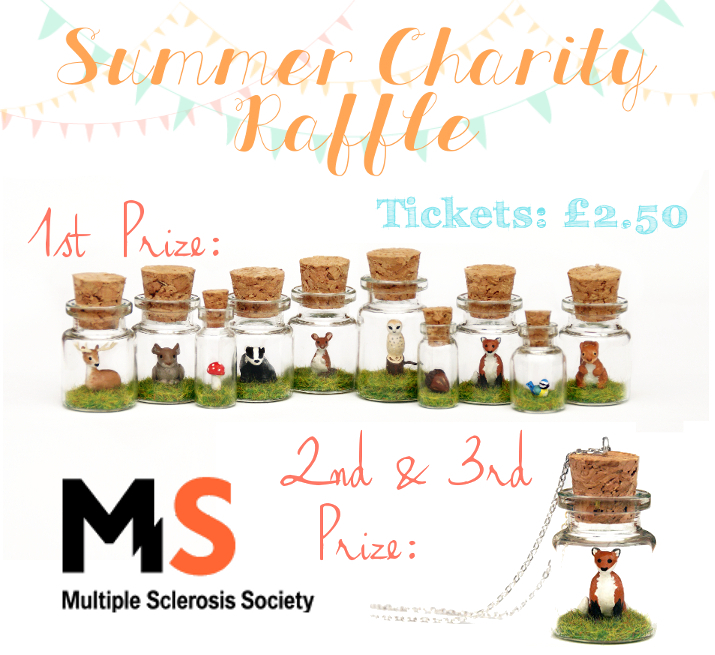 I'm working on raising money for the Multiple Sclerosis Society, the leading MS organisation in the UK, in the hopes of making some small dent in their funds for researching the disease and finding a cure. From July 1st to July 31st, I'm selling raffle tickets. The grand prize is a miniature woodland collection with a value of £250 if purchased individually in my shop, with two runner-ups winning a miniature fox jar. The tickets cost £2.50 and are open to the whole world. The winners will be picked at random, announced here on the blog and contacted directly to collect the address to ship the prize to. For more information on the raffle itself, read here. The tickets are available in my Etsy shop along with a free downloadable watercolour woodland print I made to accompany them and here on the blog via paypal. You can buy as many or as few tickets as you'd like and the names of all ticket buyers will be placed in a bag once for each ticket they purchase - if you purchase 3 tickets, for example, your name will be written down and put in the bag 3 times. The bag will be shaken about thoroughly and all the names jumbled before the winners are pulled out. Winners will be announced and contacted on August 4th. I would say "I hope you enjoyed this blog post as much as I enjoyed writing it," but I don't think you did, and I know I didn't enjoy writing it all that much either. But I hope it made a few people think about judging people's disabilities based on looks alone, and, possibly on the flip side, judging people based on the look of their disabilities. There are a great many diseases out there that deserve our awareness, but this one is unfortunately the closest to my heart.